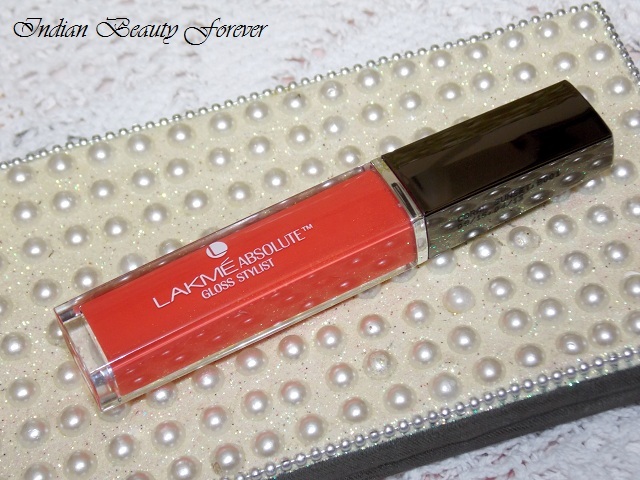 I will review Lakme Absolute Gloss Stylist lip gloss in Coral sunset today. 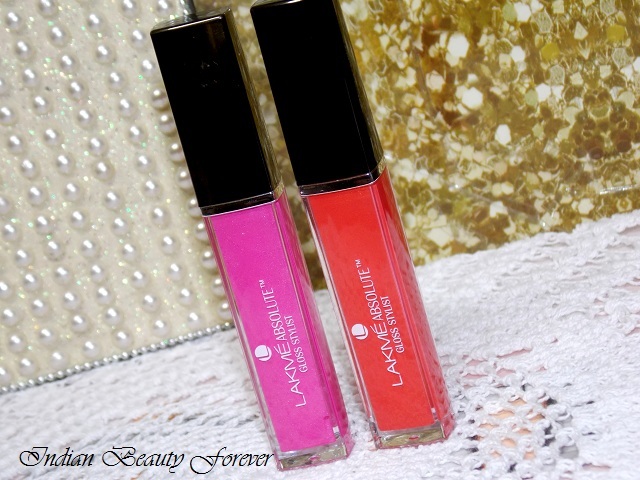 I got this along with the Lakme absolute lipgloss Neon Pink that I had already reviewed. Views: Packaging is quite decent and compact. The tube stands around 3 inches tall due to which it can be accommodated even in a clutch without much hassle. I liked the grey mirrored finished cap of the tube that holds the wand. It looks pretty. 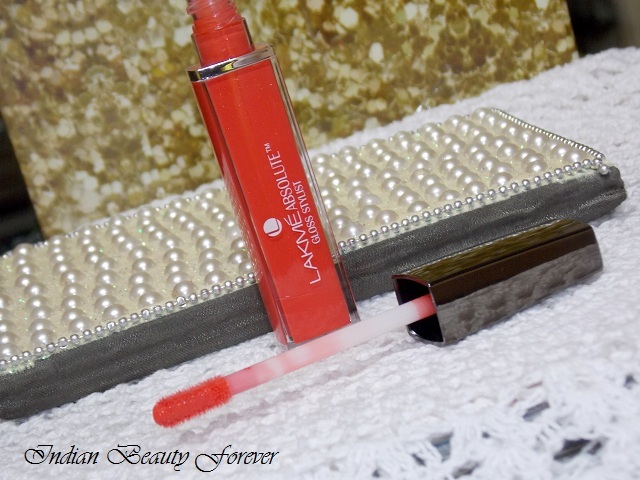 Coral Sunset is true to its name, a deep Coral color that will suit almost all the skin complexions and unlike the previous one that I had from this Lakme Absolute Gloss Stylist range, Coral Sunset is a flattering warm shade. Warmer colors compliment the Indian skin tones really well. Neon pink had these cool hues which had made the color limited to fairer complexions only, washing out the medium to darker tones whereas this is exactly the opposite of that. 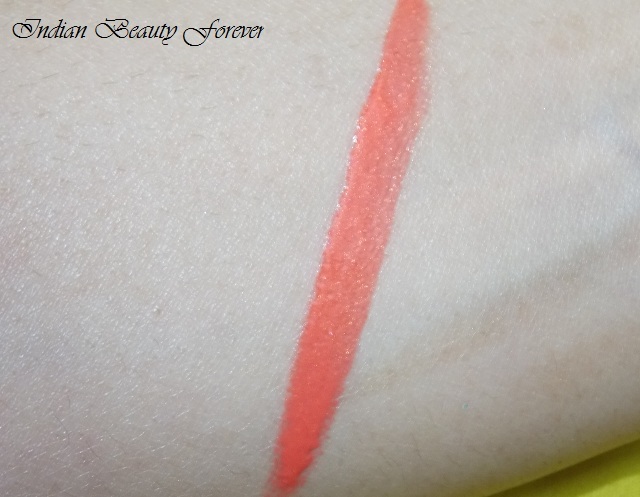 I find this shade to be very deep coral. Even when I had just applied two coats, which makes me say that it will be a perfect color for most of the Indian traditional attires, it will look really pigmented on the lips. It’s bright, warm but not red therefore, when you don’t want to go for reds. 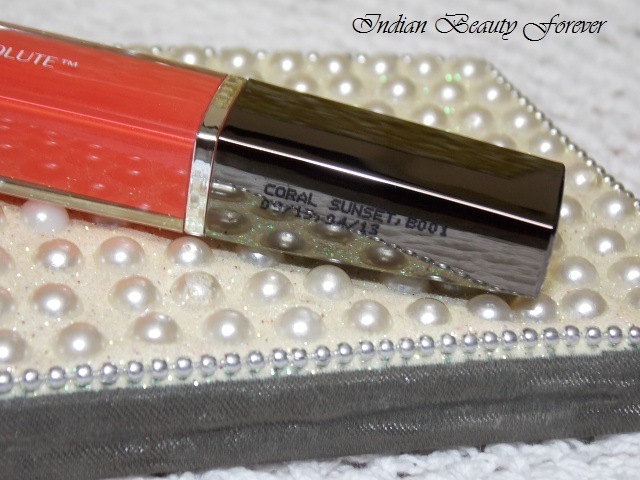 Corals like this can be a suitable choice to go with. It has more like a liquid lipstick kind of texture with gold micro shimmer scattered evenly within the formula making it more alluring as a color. 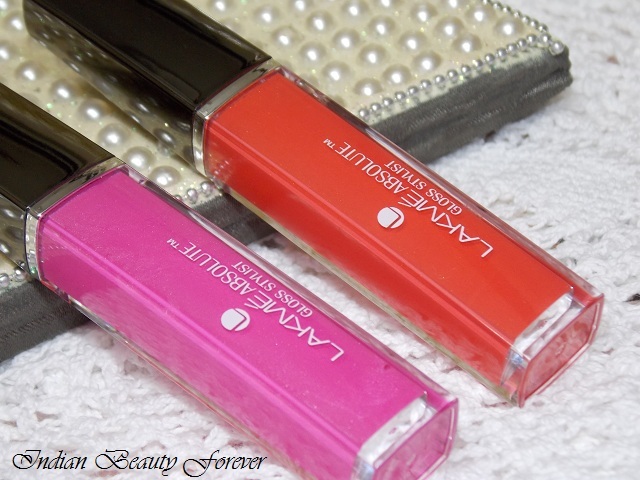 Pigmentation of this lip gloss is quite good as I mentioned, in two swipes it gives a true intense color but even after a smooth texture and good pigmentation, I realized that these lip glosses will get patchy really quick. On the arm swatches it looked even while on the lips, the finish wasn’t even sadly. As the pigmentation is good, it will hide the lip pigmentation and when gets patchy the original lip color peeks through from certain areas. I think this can be related with its not so user friendly wand, which has a strange flattened shape. 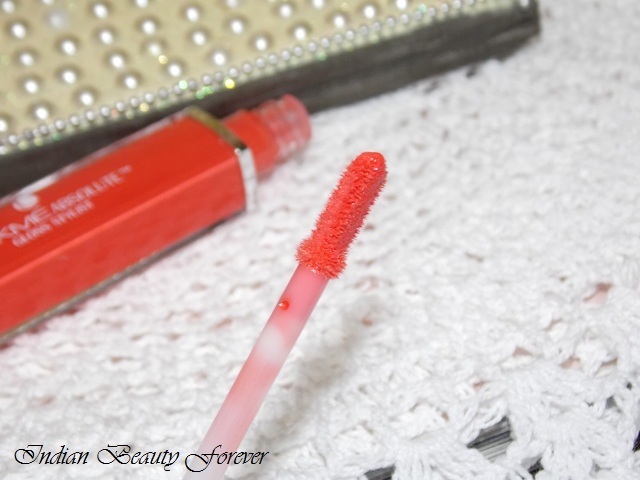 I like wands that are slanted at the tip so that while applying the gloss on the upper lip it gets distributed evenly. I discovered this little trick with this that when I would just run my finger across the lips to smear and make the gloss even it worked better than the applicator wand at least. Excuse the ashiness on my face, I was testing a foundation here. As a gloss its staying power is decent, it stayed on for around 2 – 3 hours on me which is fine, leaving a soft coral orange removable stain. Take: Lakme Absolute Gloss Stylist lip gloss in Coral sunset is beautiful deep corally color with micro gold shimmer loaded throughout. 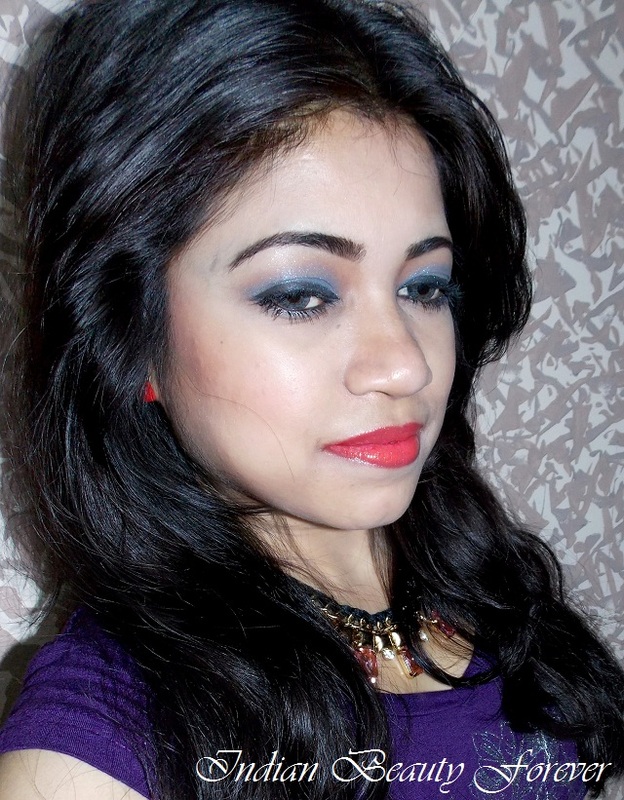 It has a good pigmentation and even texture though on lips it gets patchy. Staying power is decent for a lip gloss. I liked this more than the neon pink which was patchier and the shade was restricted for fairer skin tones. PR sample: review is honest as always! !